Orange you glad it’s Halloween?! Sorry, that was pretty bad wasn’t it? October has arrived, which means you’ve not got long left to prepare for Halloween. Make sure to get to your local Halloween store quickly before we sell out of your favourite Halloween costumes and decorations. This week we are celebrating the funnier side of Halloween – it’s Comical Week! Here’s what we’re up to in our Halloween stores Saturday October 14th. We have a wide selection of laugh your face off Halloween costumes and accessories. There will be a chance to win an inflatable chicken costume – the ultimate funny Halloween costume. 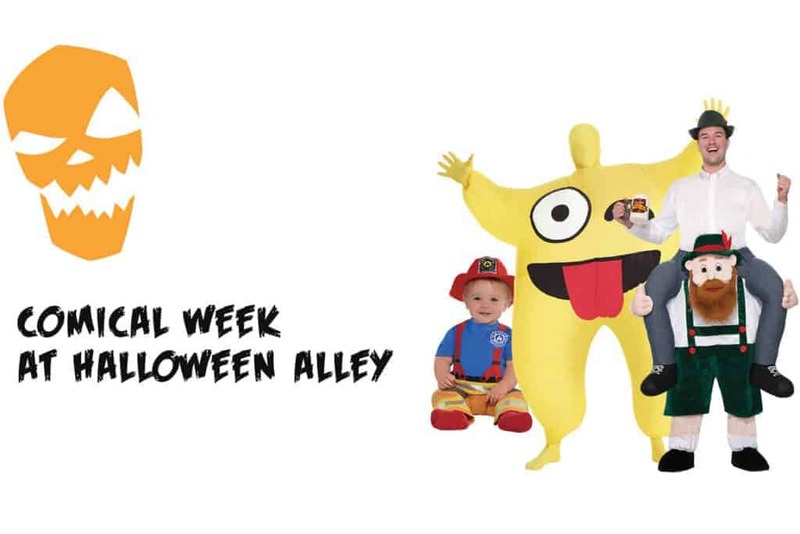 Here is the full list of which Halloween stores where we will be holding Comical Week events Saturday October 14th. Got a friend that loves hilarious Halloween costumes? Let them know about our Comical Week in-store event by sharing our Facebook Halloween event page with them. Keep your eyes peeled on our website and Facebook page as all week, we’ll be sharing hysterical Halloween costume ideas, ridiculous costume fail videos and super cheesy Halloween jokes. Have you ever worn a funny Halloween costume? We’d love to see the photos! Tag us on Instagram @HalloweenAlley. Head down to your local Halloween store today to get your hands on a Halloween costume that’ll make you the talk of the party.